I asked: How do you know you’re doing a good job? I asked: Is that right? Can anyone argue an opposing explanation for silence? : They’re frustrated. They don’t believe you’ll do anything. They’re tired of talking/asking. They don’t trust you. 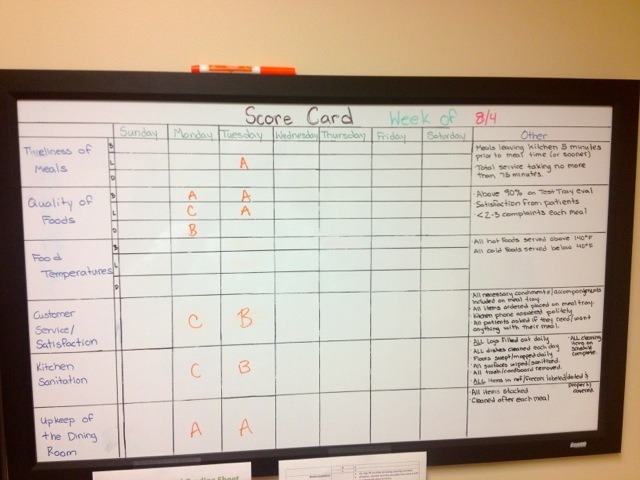 But, the reason for tonight’s post is to illustrate the oft-untapped power of scoreboarding in our skilled nursing facilities. I get too preachy. So, tonight (while writing at 35,000 feet on my way home to Baltimore), I’ll try to be brief and let the case study do the preaching. At a recent facility, we had a problem with the food. The main problem was it didn’t taste very good according to our patients. Yep. That’s a problem. So, do you do DC satisfaction surveys for all your Discharges? Now that we have data, we can set objective goals to celebrate successes and judge our decisions by. I asked our Dietary Supervisor to put up a scoreboard of the things she wants to perfect in the kitchen. Her team needs to be able to see it. There should be Daily, Weekly, Monthly things that get scored. There should be accountability, celebrations, etc. You come up with it. I want to see it up on the wall next week. The Kitchen’s Scoreboard. Fires me up! She did way better than I could’ve. And, she owns it because she created it. In addition to the scoreboard we changed the menu completely and added a few hours to the department each day to allow the cooks to give a little bit more attention and time to their meals. The dietary department now knew that they were being measured (for the first time) on objective key factors for satisfaction. They knew their supervisor was stressed about the patient satisfaction. They knew their jobs may be affected if they don’t score well too. But, they had no idea that I cared. And, the rest of the facility (particularly the department heads) didn’t know that I really cared about this and that the dietary manager was taking this so seriously. So, I decided to go all food critic on them. I channeled my inner Chef Ramsey. I began to ask for test trays for lunch and dinner. I created my own version of a scoreboard that ended up meaning a lot to them. Why? Because they see that I actually cared. Silence can mean a lot of things to your staff. But, it rarely means what you really intend. We all fill in the void/the silence with our own fears/worries. After a meal, I would send an email to the entire department head team with my Chef Ramsey Food Critic review. My dietary manager braces herself when she sees an email from me about the meal and shares the usually-good news with her staff right away. I’ve noticed a massive change in the morale and level of engagement of the dietary department — for the better. I just wanted to let you know that dinner was great tonight! The ham was moist (it’s really easy to make dry ham) and the taste was really good. Rice done perfectly. Spinach … well, cooked spinach is cooked spinach. The biscuit was tasty too. Presentation was appealing, as you can see. When I went down there to ask for a test tray tonight, I also noticed their scoreboard up in their break room. I LOVE it. Getting food to be loved by so many different palates is a serious challenge. Our scores are sometimes really high. Sometimes really low. We still have a ways to go, but in talking with Laura, I’m confident that we’re headed in the right direction. Ok … I won’t do this anymore for the whole team (yeah right) but here’s my food critic column for tonight’s dinner at the Sloan’s Lake restaurant. Tonight’s food presentation was really good again! The chicken … the taste was good but it was dry and chewy. I thought about our patients maybe having a hard time cutting/chewing (don’t know if there’s a way to tenderize the chicken but that would probably help a lot. 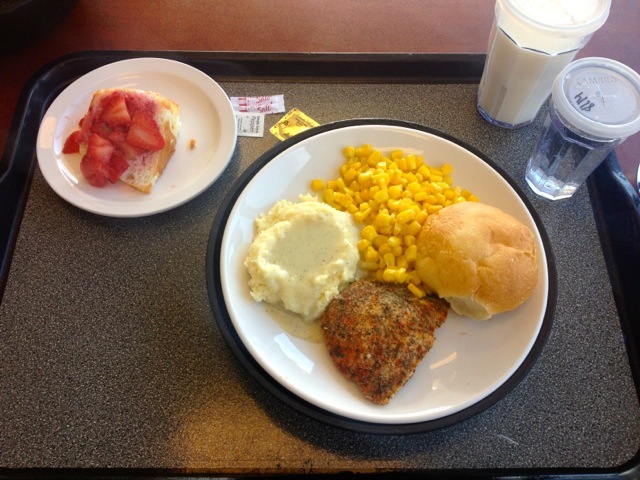 The mashed potatoes and gravy were really good and masked the dryness of the chicken well. The corn was pretty good and the roll was perfection. The desert was also good. On the sugary/sweet side, but good. Before and after photos included. The kitchen is on a roll! 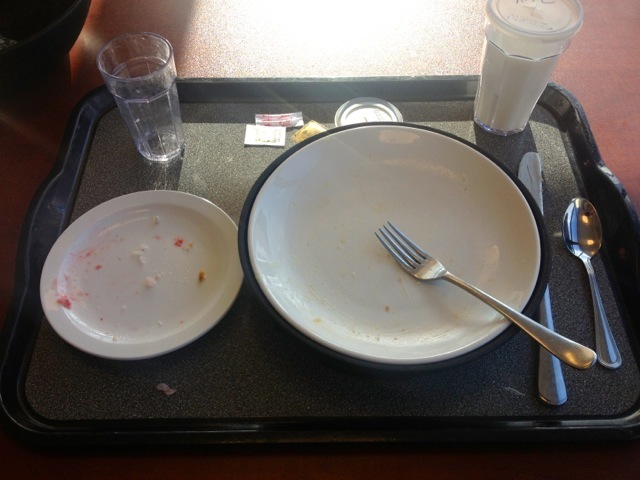 Lunch was very good today. Thought you should know. The meal: cod. The fear: dry and overcooked or undercooked. The result: perfectly cooked. Moist. Layers of fish fell away from each other easily. Flavor? Good. I had to add salt to the whole plate, but would’ve been satisfied without doing so. I add salt to just about everything. 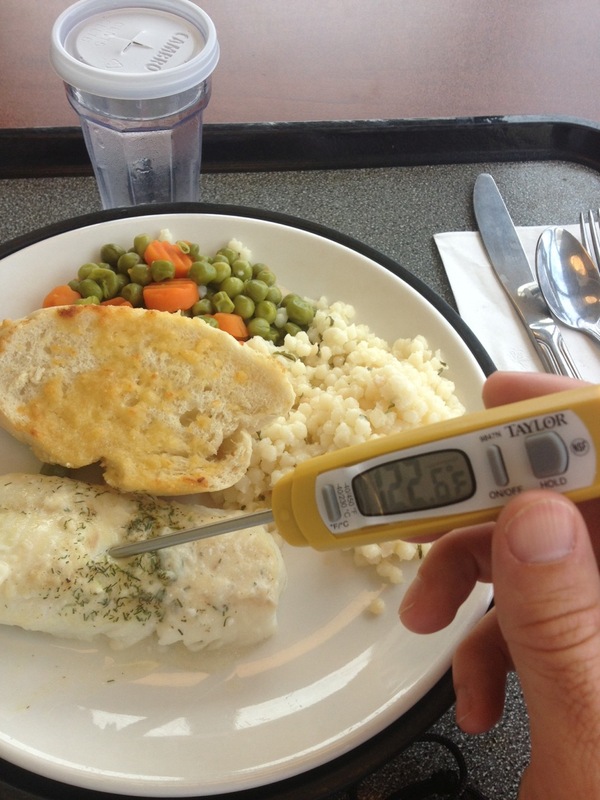 Fish could’ve used a little more seasoning since the cod probably wasn’t caught yesterday in Alaska. Nevertheless, very enjoyable. I loved the cous cous and peas and carrots too. The portion of fish could’ve been larger but I’m full after eating everything on my plate. The dessert … some sort of cream puff cake. Ummm, Yum. I had to stop after two bites because I have a wife that I go home to, but it was surprisingly good. As you can see the appearance was also very nice. Hats off to Scott today. What if I didn’t do this? The whole food critic thing? 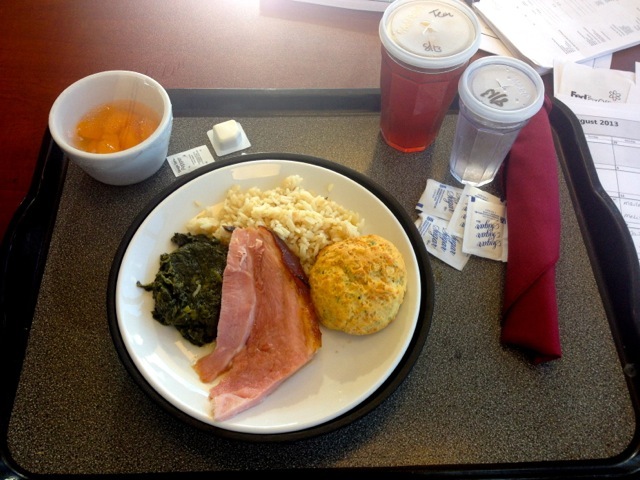 What would the dietary staff think mattered to me as the Executive Director? I don’t know. But, I’m pretty sure they wouldn’t think that I cared much for their food or much about their work. PS: August’s patient satisfaction scores hit 8! The entire staff applauded the kitchen staff at our all staff meeting for their progress this week. I just got the chills. You?